Known as the “New Year for the trees,” the Jewish holiday of Tu B'shvat is celebrated during the rainy season, timed in accordance with the arrival of the most essential ingredient for the rejuvenation of Israel’s flora. In modern times, Tu B’shvat has become an ecological awareness day, and annual campaigns run by nonprofit organizations and local schools across Israel seek to cultivate greenery throughout the dry region by planting young saplings. While SPNI appreciates the good intentions behind these efforts, our approach is different, as it takes into account the more complex aspects of ecology and sustainability. Every year on Tu B’shvat, we call on the public to “plant smart” and use this opportunity to educate the younger generation about bio-diversity, local and invasive species, urban nature, and our delicate ecosystem. For Tu B'shvat this year (January 31), a team from SPNI’s Tel Aviv Community Branch and Hani Peleg, the Ministry of Education’s Director of Sustainability, will be running a ‘Plant Smart’ activity at the Bialik-Rogozin school in South Tel Aviv for the school’s 1,200 international students (originating from 51 different countries), a group of Eritreans guests, and other local community members. 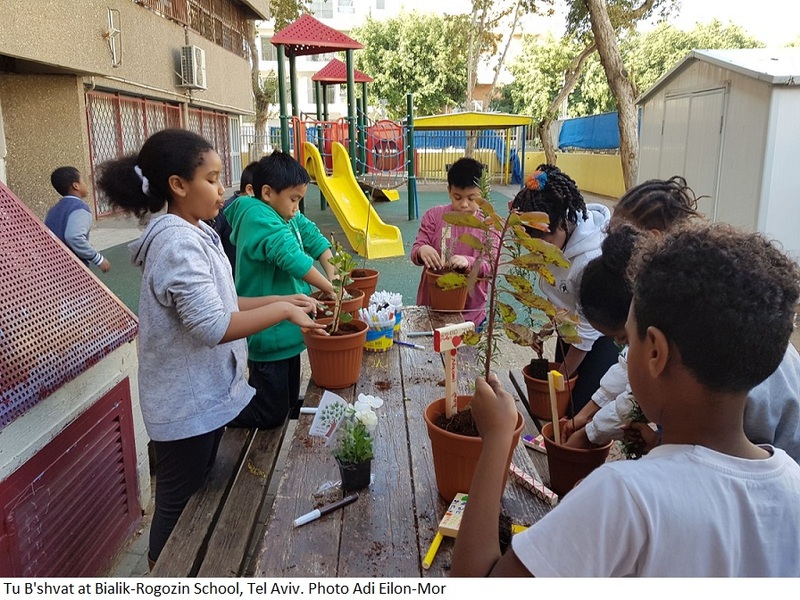 The children will work together to plant 40 saplings of local species of trees donated by KKL, including carob, oak and jujube, in designated planters. The different student groups will then adopt each of the saplings for a period of two years, learn about the different types of trees, practice responsibility over them by nurturing and cultivating the young trees, and transferring them into larger containers if necessary. When the trees reach maturity, they will be donated to the municipality of Tel Aviv to be planted in the southern district of the city for the public to enjoy. 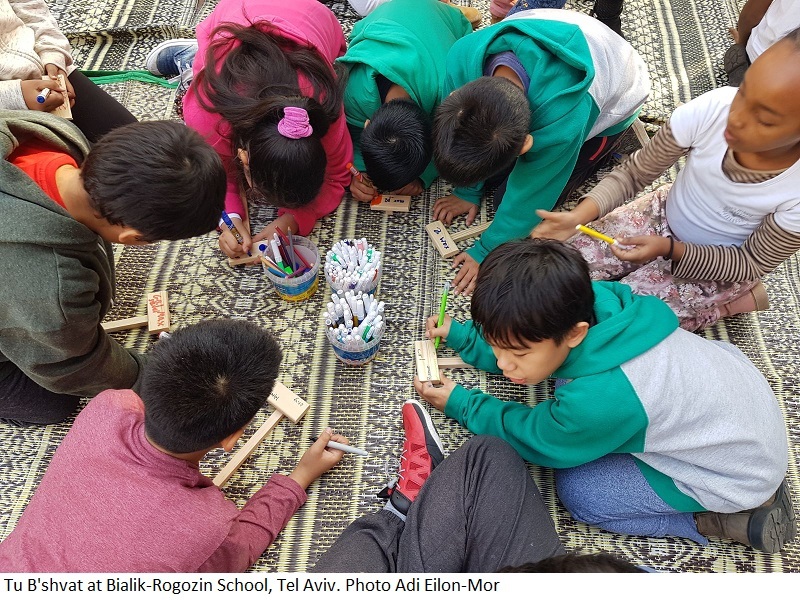 This special Tu B’shvat activity is part of a more extensive educational program being run at the Bialik-Rogozin school over the next 10 years with the goal of integrating sustainability and ecological values into the school's curriculum. As part of the program, the school will soon begin planning and constructing a garden and an ecological space on the school's grounds. The program was made possible by the generous support of an SPNI donor. "With the current threat of deportation hanging over families in the neighborhood, there is a great deal of tension and constant disruptions to their daily lives,” said Galia Hanoch Roe, the Director of SPNI’s Tel Aviv Community Branch. 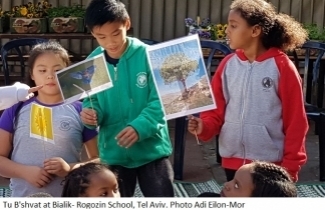 “It is uplifting to be able to provide these children with a positive and empowering experience through nature appreciation and by connecting them to Israeli culture and the Jewish celebration of Tu B'shvat. We are thrilled that the Ministry of Education sees this opportunity in the same light and is supporting this important educational venture."